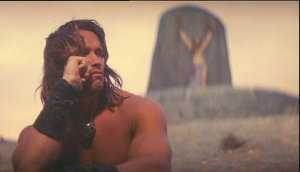 "Conan - The Barbarian" features relatively few action scenes, considering it features Arnold Schwarzenegger as a main actor. 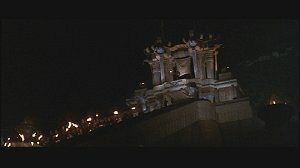 The movie rather wins its audience over with the atmospheric depiction of the time it plays in and a succeeded composition of scenery shots and also Basil Poledouris' score, who also worked on several famous works like "Starship Troopers", "Hunt for Red October", "Free Willy 1 & 2" and "Robocop 1 & 3". The German DVD, which was used for comparison here, contains the uncut US theatrical version. The Extended Version of the movie, which has been released in the US contains old footage, renewed and integrated into the movie. The effort goes to show, because through these new scenes, the film gets much more complexity, especially in the otherwise rather boring ending. It should be added that the image of the US-DVD is shown in the original 1:2.35 format and that you really recognize the anamorph scanning, because the image is much sharper than the German DVD's. All the other extras are also much more convincing: Aside the obligatory trailer, deleted scenes, an audio commentary with Schwarzenegger and the director, as well as several background information about the movie are presented. In the second comparison, both the time index of the extended version and the theatrical cut are indicated. 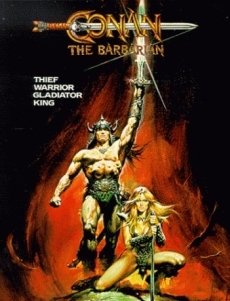 Just like in the old, cut version, the extended version misses the short take of Conan turning his back to the princess after she told him HE would kill him etc. 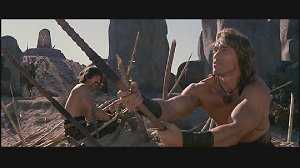 Conan and Subotai sharpen some sticks as traps and blockage. As they do this, Conan starts telling how he went for a walk with his father on spring days like these, the air smelling sweet and the leaves being dark and green. Angrily, he rams a spear into the sand and mourns the 20 years of pointless battle, without a break and without sleeping like the other men. 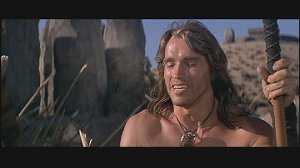 Then Conan asks Subotai, whether he knew those winds as well, he answers that they blow in his homeland too etc. 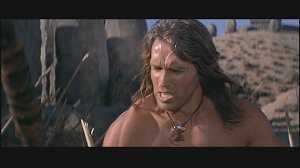 The discussion continues like this, until Conan says that there was no spring for men like them. There was only the fresh wind before a storm. 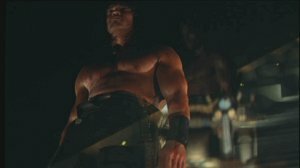 Subsequently, a scene in which Conan kneeingly digs a hole and does other fighting preparations takes place, but this is also contained in the normal version. 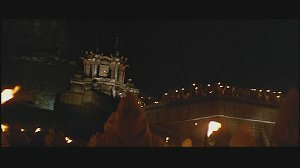 After the big fight between the stones, you see Thulsa Doom with a torch on the temple's balcony, looking down on his followers. The extended version features another distant shot of Thulsa Doom. Now it's getting a little complicated. From this part one, both versions often feature different footage. 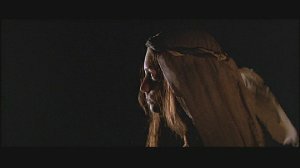 Here, the extended version is, of course, superior over the normal version considering the length of most of the scenes. 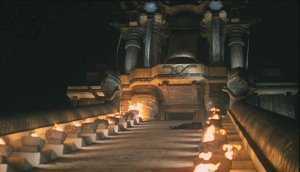 The biggest difference is, that Conan fights his way through the temple to get to Doom on the balcony all by himself in the normal version. 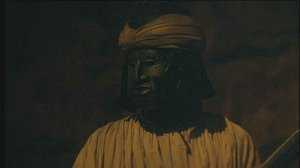 The extended version shows the princess, king Osric's daughter, who was rescued by Conan and his companions. Rescued princess climbs a small stairway barely clothed. She clasps her arms and passes the guard, who doesn't interfere because she probably thinks the princess was one of the sect's members. The guard is looking at her, distracted, as conen grabs her (the guard!) from behind and cuts her throat with his father's broken sword. Then he puts her aside and hits her once more with the destroyed sword. The princess is still in the foreground. After said part, in which Conan climbs the marmoreal landing (see orientation images 1 & 2), you see the guard in a close-up in the normal version. 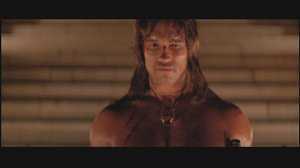 Suddenly, Conan grabs her from behind and silently cuts her throat with the broken sword, as well. Then, he puts the body aside. 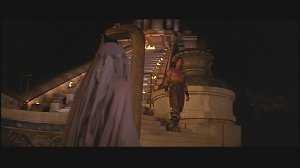 After this, in both versions differing, termination of the guard, Thulsa Doom, who still faces his followers on his balcony starts talking in both versions. The extended version starts earlier, though. Thus, you see Doom stand on the balcony for a longer time. This way, he says his line about the day of purification on-screen instead of it being a voice-over in the normal version. You only see him as he says the following sentence, that his day has come. The princess continues to crawl through Thulsar Doom's temple with stretched-out hand. Another guard is standing with the back faced to her from a distance. 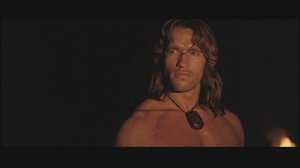 The camera follows her as she walks, until Conan, leaning at a scarp to the right, appears. The two continue to sneak up on the guard. 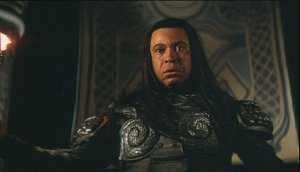 During that, there is a voice-over of Thulsa Doom. 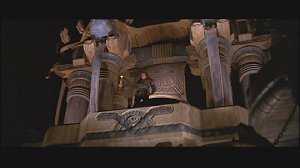 The normal version does not feature the scene with the second guard, instead, Thulsa Doom is shown from further below on his balcony. 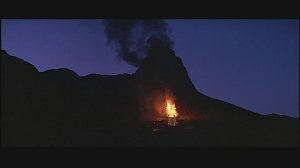 The things Doom says are mostly identical, though, but you hear it from outside the temple as you can see him from a distance. As Doom continues talking, Conan ascends some stairs leading to the balcony Doom is standing on. 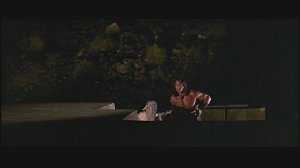 This part of the shot showing ONLY Conan climbing the stairs is missing in the extended version. The footage still differs in both versions, whereas the extended version, as usual, contains more footage. For better orientation, the scene in which Doom's followers are shown, looking up to him and chorusing "Doooooom!" will be set as new orientation spot (see orientation image 1). This scene is namely contained in both versions. 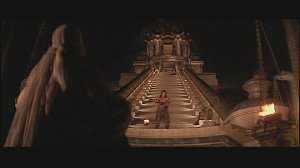 After said scene, the extended version also features the shot depicting Conan ascending stairs to Doom's balcony. 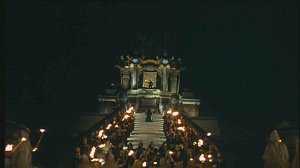 The scene only starts a little later, namely as Conan already is up on the steps and the princess appears, who follows him. The scene probably wasn't integrated completely because it wouldn't have fit Doom's speech. Still, the extended version is a little longer, and therefore the voice-over of Doom's speech has been extended slightly. 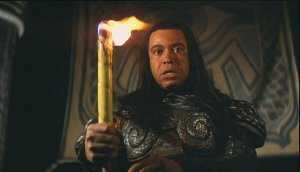 Thulsa Doom clasps his hands with the torch he just held in his right hand. After these completely different scenes, both versions feature the priest on the stairs. For better orientation, this scene was also set as new orientation spot (see image 2). 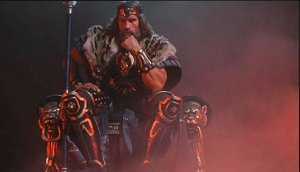 Not only Conan approached Thulsa, but also the princess. She is silently walking around in a close-up shot. 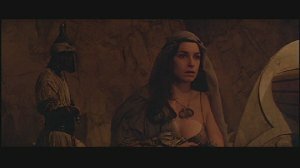 After Doom called Conan "my son" the last time and Conan therefore looks a bit disturbed, the princess is shown one more time. 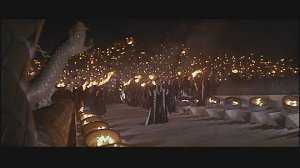 The camera continues to sway to the left, until the well Doom's freed followers threw the torches in, appears in the image. The princess is standing in front of the well, looking up to Conan. 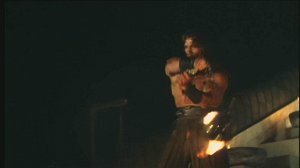 The scene in which Conan starts swinging the fiery oil in the iron container to subsequently throw it onto Doom's temple contains slightly different footage in both versions, whereas the extended version is much longer. The princess is sitting in front of the well in a meditating stance. 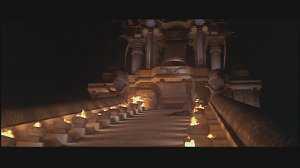 Then, Conan is shown at the foot of the big stairway. 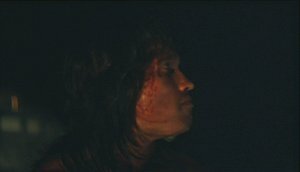 A close-up of the princess takes place, then Conan takes the fiery oil from its mounting. He starts swinging the vessel, grabbing at at the end of the chain. As he does that, he is shown from the well's (the one the princess stands in front of) position. 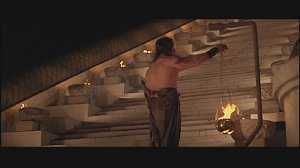 After Conan has risen from the stairway, he walks down a few steps. 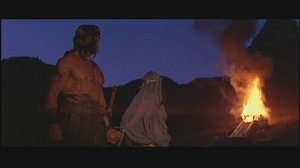 Then, Conan already has the oil lamp in his hands and you see him from another, closer, sideways perspective starting to swing the oil. 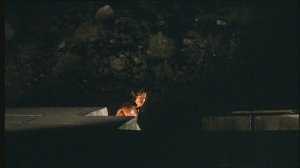 This shot is also contained in the extended version, but it starts later, as the fire is already swinging pretty fast. 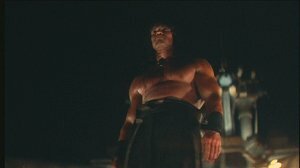 So the beginning of the swinging from this perspective has been removed from the extended version, because Conan started swinging the vessel from another perspective just before. 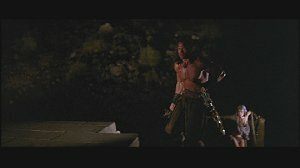 Therefore the scene couldn't have been cut differently, because Conan would start swinging the vessel twice, once from below and once from the side. 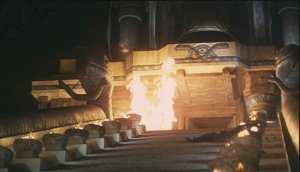 After conan has thrown the fire container onto the temple, another shot of astounded princess is contained. 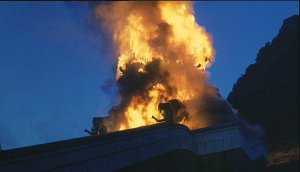 You only see the palace starting to burn until it's engulfed in flames in fast motion. 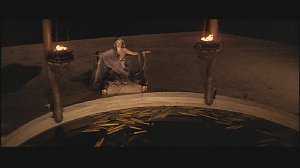 Then, the scene depicting Conan sitting on the throne and the narrator starting to report is shown. The extended version is much longer here, although it contains almost all scenes from the normal version. 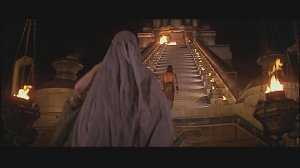 Shortly after Conan threw the fire onto the palce, the princess, still standing next to the well below him, is shown. Both watch the palace start to burn. 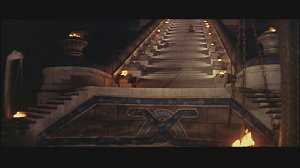 As this happens, the princess excitedly gets up and runs around the well to the stairway Conan is standing on. She is kneeling down before him, but Conan negligently walks past her, but then he stops and turns around to her. Slowly, she gets up and reaches her hand to Conan. 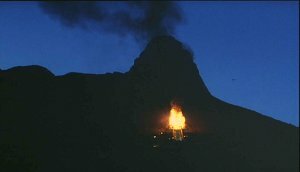 Subsequently, a shot of the burning palace, which is also featured in the normal version, is shown. 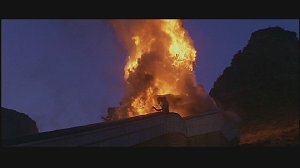 This shot is being followed by a take depciting Conan and the princess, holding hands, stand in front of the burning palce - not contained in the theatrical cut. After that, another shot of the burning palace (from further away! 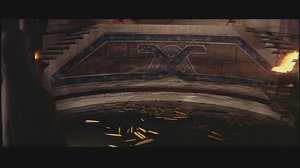 ), which is also contained in the theatrical cut, is shown. 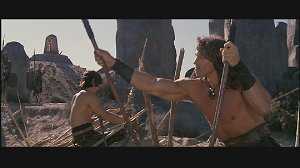 Then you see Conan carrying the princess through the rocky area on his hands. 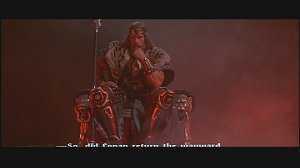 After this scene, which is missing in the normal version, the extended version also shows the final scene with Conan sitting on the throne and the narrator starting to report.